Following the same course as the Run To Squaw did back in June, this is the final run in the Big Blue trail series. Less of a trail run than a bike path run, but it's a beautiful location, and a fun ending in the alpine village at Squaw. Also coincides with the Oktoberfest, so enjoy a beer and brat after the finish if you're so inclined. This has been one of my favorite fall races over the years - I've done the half marathon a couple times and the 10K twice as well. A great course starting on road and then transitioning onto some great trails around Fallen Leaf Lake, and for some reason always interesting weather. I've run this in both rain and snow, and this year looks like it might be a bit dicey as well. There's also an Oktoberfest event at nearby Camp Richardson after this race, as well as the whole associated Kokanee festival. This was my fifth straight year of running the Lake Tahoe Marathon. 2007-2011. This year, I finally beat the time I put down my first year at it. But it hurt. It was an early morning. 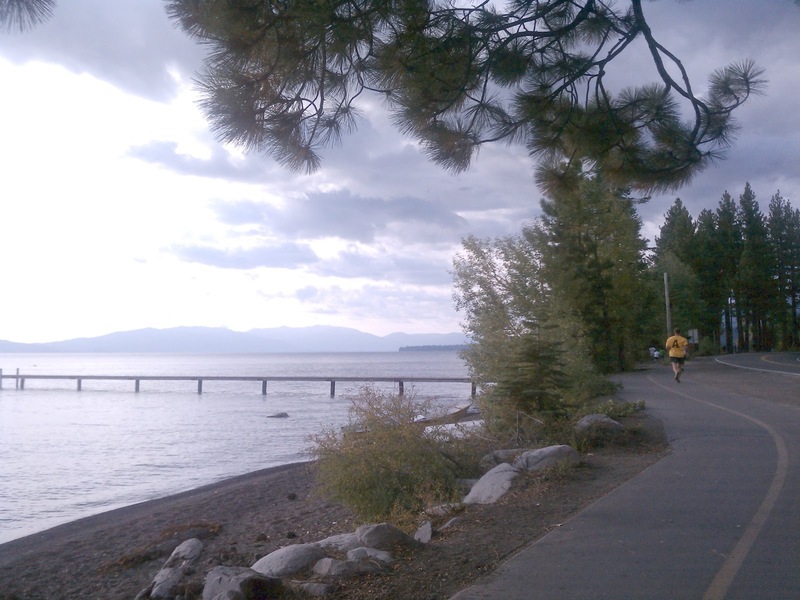 While Tahoe seems like kind of a "local" race for Reno. it's kind of a pain to get up there. I woke up at 3:45, had a quick bowl of granola and a banana while I made some tea, did a couple of last-minute things, and was driving away by 4:15. That got me up to the Horizon Casino in Stateline in time to catch the 6:00 shuttle bus that took me around the east side of the lake to Tahoe City, where the start line is. Despite the warning email that it would be cold at the start (near 34 degrees, it said) it was actually pleasant. That is, until the sun went behind a cloud and the wind kicked up. But that didn't happen too often. Looked like a great day to race. The early miles rolled along uneventfully. I was trying to keep my pace around 8:00 miles, but it kept creeping down - every time a second clicked off my cumulative pace readout on my watch, I cringed. I think the lowest it got was 7:48, and after a couple small hills, I hit the halfway mark with my average pace right around 7:50. 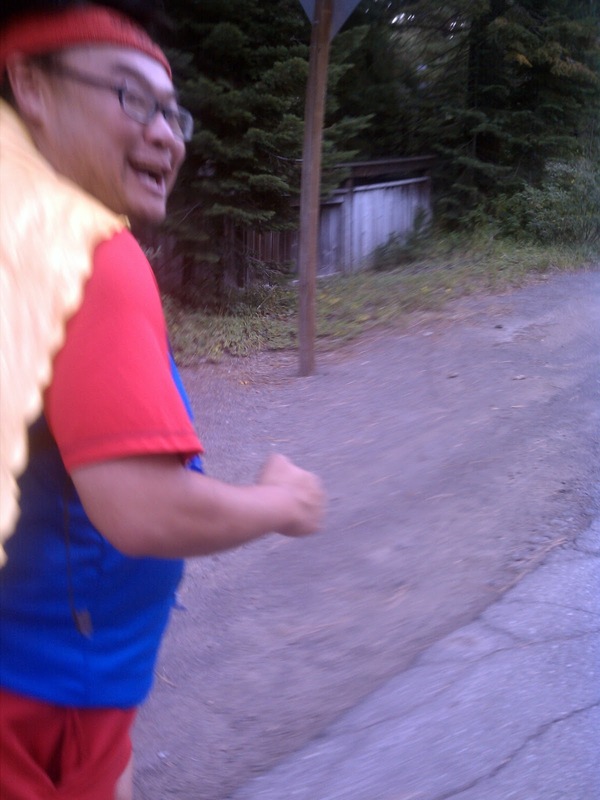 There were some characters out running this year. 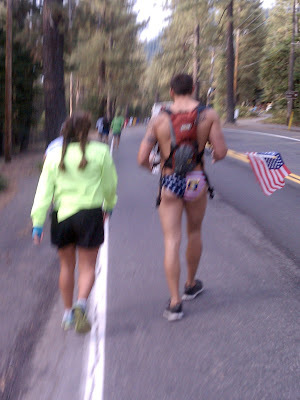 This guy was, apparently, " Endorphin Dude." He was either a tripler (3 marathons in 3 days) or a super tripler ( marathon, marathon, 72 mile ultra); not sure which. And THIS guy. From what the announcer at the start line said, this patriotic ultramarathoner decided to forgo even the flag Speedo while it was still dark out, and run in the altogether. Glad he A) didn't get arrested and B) put something on before I saw him. Booty shorts indeed. Not too long after the halfway point is when the hills start. There are a a few little rollers before you get to the Hill from Hell, which climbs from near lake level (6200 feet) to 6900. 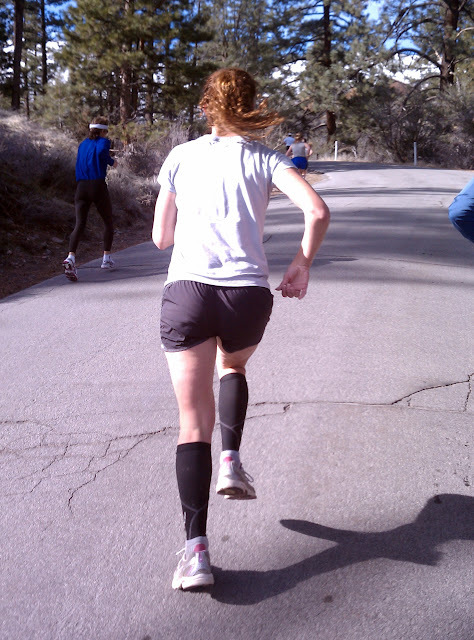 It was my goal to run all the hills this year - just put my head down, shorten my stride, and grind up them. Didn't quite happen. I made it pretty far, but there was a point at which I just had to stop running - took a 30 stride walk break, and wow did my legs feel weird. I think I took 3 of those little breaks on my way up that hill. The course then does a few little rolls before a nice, scenic descent into Emerald Bay. Tried to hold some speed on the downhill there without trashing my quads. Then there's a short but STEEP uphill out of Emerald Bay - took the same 30 stride walk breaks on that, right from the start. But after that, you're rewarded with a scenic, winding downhill. After you bottom out of that downhill, there are still 4-5 miles to go. This has always been the hardest part of the race for me, and this year was no different. After transitioning from the road onto a bike path, for some reason I lose motivation. I think it was with about 3 miles to go that I took my first little walk break. Didn't help that the guy in front of me was doing the same - we leapfrogged each other for a while doing that. But finally we passed Camp Richardson, made the turn into Pope Beach, and were on the home stretch. At that point, I knew I wasn't going to break 3:30, or even 3:40, for that matter. Didn't care, I just wanted to get done, hear my name announced at the finish, and go jump in the lake. But about 200 feet before the finish I heard footsteps behind me, and someone blazed past - the half marathon winner blew by me and upstaged my finish. It was actually kind of funny - he was Japanese, came over from Tokyo, and had a name that the announcer tripped over a few times. So I didn't get announced through the line, but that was OK - after I stopped my watch, someone handed me a little blue slip that was my claim to pick up a top 25 finisher windshirt. Getting one of those had kind of been my secret goal for the race, outside of any time goal. I was getting weirdly emotional at this point - kept having little moments of being choked up and wanting to cry. Forestalled that by going for a soak in the lake. A guy that was coming out from having a dip told me that it was "really cold, but worth it." In fact, it wasn't all that cold (for Tahoe) and I spent about 10 minutes standing in it before I dove in to rinse off. Funny thing about doing the little standing-in-the-water dive-under thing - in order to come back up, you kind of arch your back and point your toes. Well, when I did that, both calves cramped up big-time. Spent a couple of minutes trying to get them back to the point where I could walk back up to the beach. Finally made it; got changed and grabbed some food - post-race hot dog, banana, cookies and stuff. I kept checking back to the board where they had some results posted to see if the marathon results were up, but there was nothing. Finally, I found the awards table and asked them about it - apparently the computer had frozen and they were trying to get it fixed. Waited around for awhile to see if I had placed in my age group, but eventually gave up and wandered off to the shuttles. 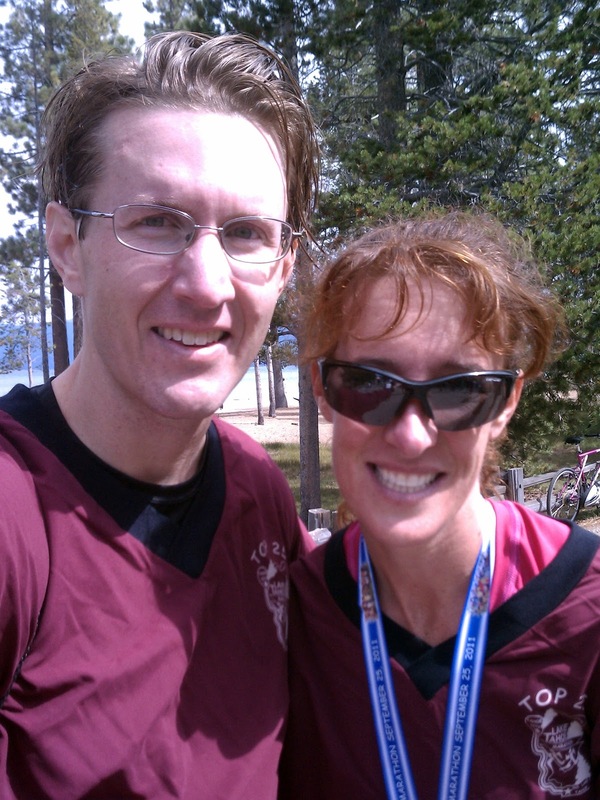 Gretchen and I with our top 25 windshirts - and post-race hair. After such an early morning, and a hard race, it was an interesting drive back to Reno. I made it thanks to a can of Starbucks Doubleshot Mocha and a CD of punk covers of 80's hits that I unearthed from somewhere in my car. Lots of singing along on the way home. I celebrated with a Full Sail bourbon barrel aged imperial stout, and a trip with the family to our local sushi spot. Race results showed up this morning - looks like they clocked me at 3:42:44, over a minute and a half slower than the time on my watch. 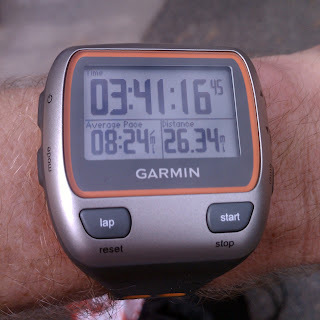 That's kind of disappointing, but I guess it's now my "official" marathon PR. Just as well that I didn't wait around for awards any longer, because I ended up fifth in the male 35-39 age group. Funny, that time would've got me second in the 30-34 group, and third in the 40-44 bracket. Oh well. 14th overall, which I'm pretty ecstatic about. And it looks like the results have been tweaked slightly - that or I was completely looking at something wrong yesterday. Now they've got me at 3:41:12, which is much closer to my watch time. LOTS of stuff going on this weekend. Yeah, I don't know how they keep it all straight either. I'm lucky to make it to the start of the marathon on time. Friday and Saturday, in Rancho San Rafael, will be the 5K Foam Fest! Wish I could do this, it looks like fun. A series of obstacles, including crawling under stuff, through foam pits, and through a squirt gun barrage. 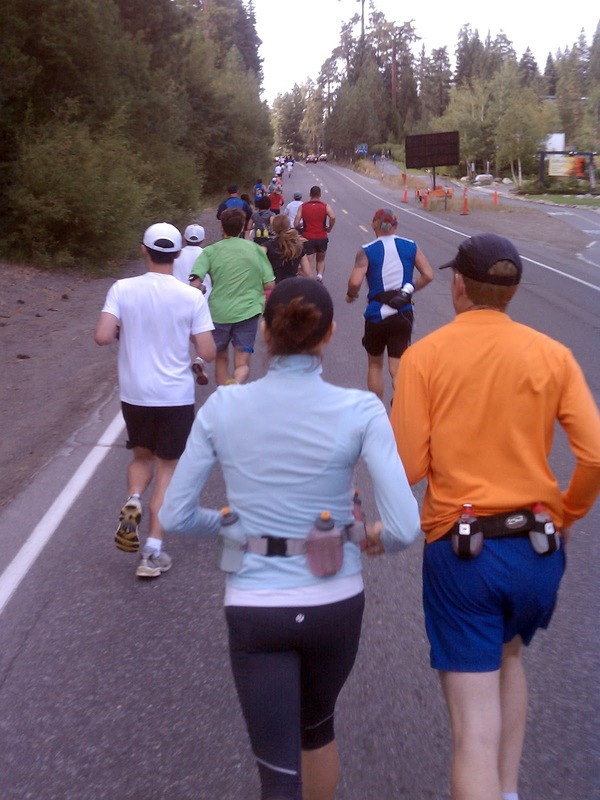 Also on Saturday is the Battle of the Rattle - a mix of road and trail 5K running up Rattlesnake Mountain in south Reno. This one always seems to have a fast field, and looks like fun - I wonder if you have to run back down afterwards, too? Sunday brings us the Northern Nevada American Heart Walk and run in Sparks, out in front of Scheels. There's a 5 or 10K option for the run, which goes off at 9 AM, well before the 10 AM walk. And if you're looking for a trail run on Sunday, there's the Desert Dash 5K/10K starting out at the Golden Eagle Park area in deep Sparks. This one benefits the Susan G. Komen for the Cure charity, and looks like a good way to explore some new trails out there. Thanks for everyone's concern about my leg/ankle issue - just wanted to give a little update here. I told most of the story a couple weeks ago, in posts here and here. The basic recap of those is that my lower left leg started hurting, I rested it for about 5 days, tried running again, and it still hurt. Saw my doctor and had an x-ray which didn't show the stress fracture that I had feared. After that there was nothing to do but rest it more. So I did that - for two weeks, even skipping the Lake of the Sky trail marathon which I had already registered for (my first DNS!) Unfortunately, I didn't do it very smart - I should have switched to some cross-training and continued all my core workouts. What I did do was absolutely nothing - and the fact that I allowed myself the luxury of a couple beers most nights meant I put some weight back on over those two weeks. At any rate, last week I did a couple of test runs - 3 miles Wednesday and 5 miles Friday - on which the leg felt absolutely fine. 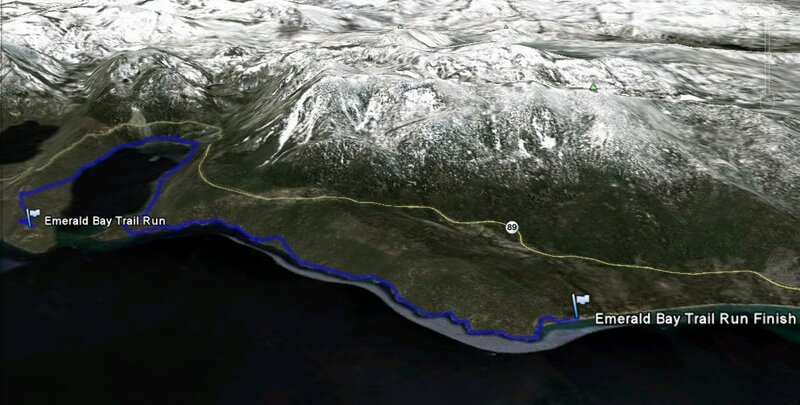 That set me up to do the Emerald Bay Trail Run on Sunday, a 7+ miler that went pretty well. I thought I felt a couple twinges from the ankle near the end, but it wasn't bad at all. So this week is technically the taper week for the Lake Tahoe Marathon, but I'm using it as a "get back into the swing of it" week. I had some easy intervals (8 x 2:00) on Tuesday, and easy half hour this morning, another 30 minutes plus strides tomorrow, and a really easy keep-'em-loose run on Saturday. So far between yesterday and today, I've been able to feel the leg ankle pain slightly more each day. This despite the treatments I've been giving it. I haven't been icing it - my doctor didn't think that would be helpful, but I may start up again. I've been using arnica gel on it, at the suggestion of my mother, although I don't have a lot of faith in it. Ibuprofen does help when it's feeling sore. And this morning I tried some KT Tape, in a shin splint wrap, to see if that would make any difference. Didn't seem to this morning, but I'll try the wrap again a little more aggressively tomorrow morning. So what does that mean for the Lake Tahoe Marathon this weekend? This was really my goal race for the year, what I've been training for over the past 10 months.Before this injury, my goal for the run would have been to run under 3:30, and hopefully to finish in the men's top 25 and pick up one of those ridiculous yellow finisher windshirts. To do that, I was going to try to run the first half in under 1:40, around 7:30 pace - then slow on the hills and pick back up for the last 5 miles. I had been feeling pretty good about that plan, but don't think I'm up for it now. My adjusted plan calls for starting out in the 8:00 per mile range, doing what I can on the hills, and seeing how the last section shakes out. Hoping I don't turn this into a sufferfest, like it has been a couple of years. I have a feeling I may be suffering differently by the end of it - but we'll see. Addendum: Thinking about this while running this morning - I'd kind of just like to PR on Sunday. 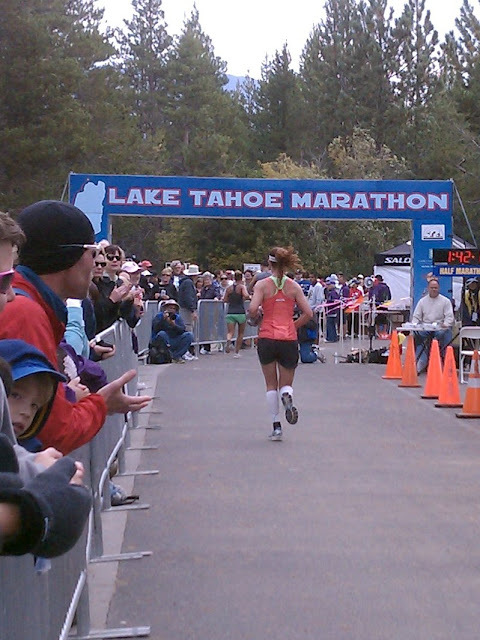 As my marathon PR is on the Tahoe Marathon course, and is 3:54:14 (from all the way back in 2007), I'm pretty confident that I can do it. I mean, three weeks ago I was fairly sure I could run near 3:30 on this course. But at any rate, I may take it even easier in the early miles to make sure I don't blow up later and miss a chance for a marathon PR to add to my 5K, 10K and half marathon bests this year. Got to do a race this weekend that I've been hearing about, and wanting to run for a few years now. The Emerald Bay Trail Run always seems to land on the same day as the Reno Gazette/Journal Jog, and I've usually opted for the closer option - I can ride my bike the mile down to the start of the Journal Jog. 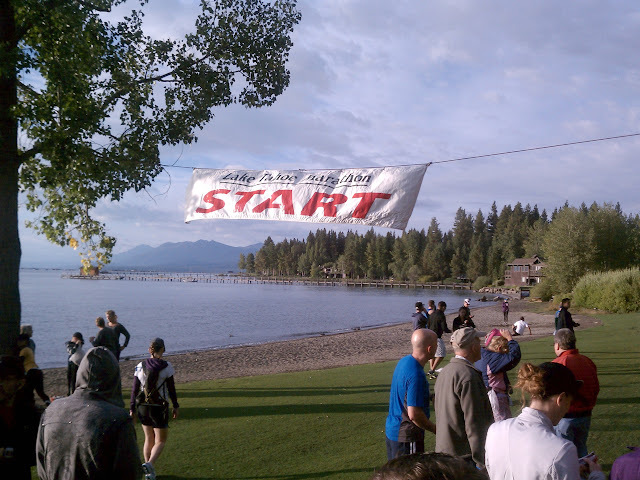 This year, though, the Emerald Bay Trail Run is part of the Big Blue series, so I had to drop the Journal Jog and head up to Tahoe. We made our way down to the start area - a good pitch downhill towards the water, which we would have to run right back up a few minutes later. This hill on pavement gets people spread out nicely before entering the singletrack trail. One guy was way out front heading up the hill, then we all disappeared into the trees as we hit the trail. The course wraps around Emerald Bay from the south to the north, ending at D.L. Bliss park. Not really sure what happened on the Google Earth elevation, but, yeah - not what I was expecting. Just to note, that same process had worked beautifully for a couple of earlier races I had used it for. Stuck around for awards - Abbey took 3rd in her age group, and brought home a pint glass - and I won a heart rate monitor in the raffle. May have a blog giveaway with that one of these days, we'll see. Shuttled back to the other side of the Bay, and headed back home. While I was a little sorry to have missed the Journal Jog, that was a great race. Super fun and beautiful trail, and of course great company. This is the last race in the series before the Championship - so if you're thinking of trying to qualify for that, it's your last chance. I'm still kind of bitter about the horrible experience I had at the Bear Valley version of this event last year. But for 2011, they've moved it to Squaw Valley - we'll find out if they pull some of the same lame stuff on this year's contestants. Obstacle course at altitude. One of the biggest community races in Reno; the 43rd annual this year. 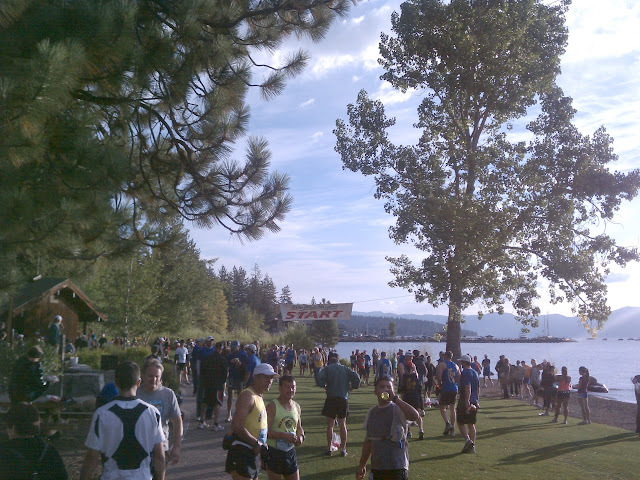 An 8K walk/run Starting near Reno High on a pretty flat course along the Truckee River, and looping back. Always a fun event. Emerald Bay Trail run - "Bay to Bliss"
I've heard about this run for a few years now, and as it's part of the Big Blue series I'm doing this summer, I finally get to check it out. 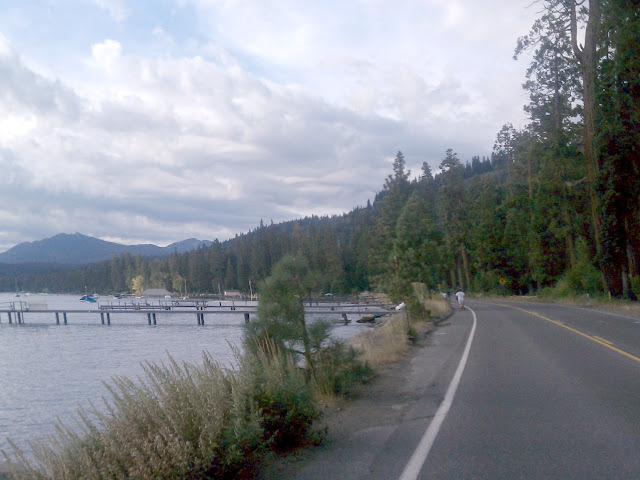 Runs right along Emerald Bay, from the south side to D.L. Bliss state Park on the north. Hopefully I'll get some good pictures out of this one. Part of a series of Iron Girl events, this race out of South Lake includes a 400M swim, 24K bike and 5K run. Pretty sure you're gonna want a wetsuit for that one. Also runs events on Sunday as well.